This holiday season, Drive Electric Northern Colorado (DENC) is looking back on the progress the PEV community has made since our program launch in late February 2013. Driving electric is critical to saving money, reducing our oil dependency, and protecting the environment. We have put together a quick DENC Year in Review to share a few of the program’s early accomplishments. Certainly there is more work to do in 2014 but we would like to extend our appreciation to everyone who has been involved during the last nine months – your support and enthusiasm have created a strong start, and we are looking forward to working with all of you in 2014. We asked EV owners in Northern Colorado what their favorite memory of 2013 was. Here’s what they had to say. We launched the program on a snowy February 25th 2013. 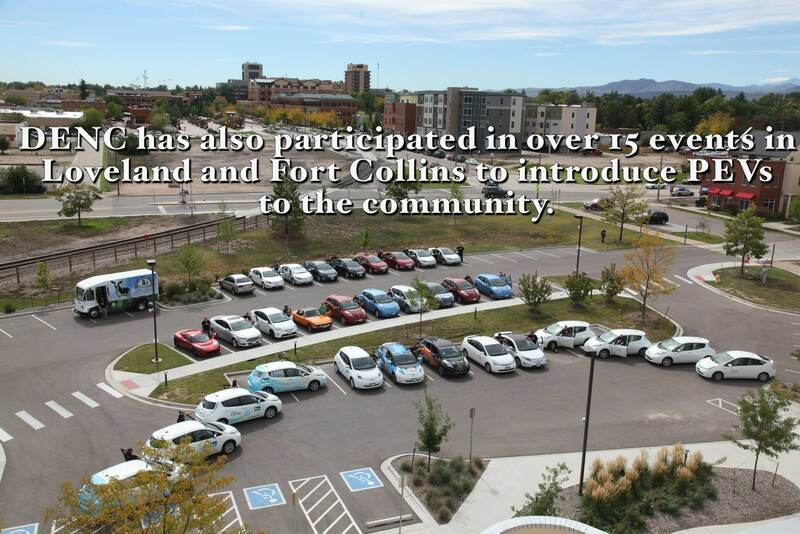 The founding partners included the cities of Loveland, Fort Collins, and Colorado State University with strong support from others helping expand the use of EVs in Colorado including Project Fever, Colorado Clean Cities, Dellenbach Chevrolet, Tynans Nissan, Erhlich Nissan, Nissan USA, Former Governor Ritter, Odell’s Brewery, New Belgium Brewing Company, and Northern Colorado Clean Cities. With help from Co’s BMW in Loveland, the BMW i3 launched in Colorado on November 13th, before the release at the LA Auto Show. This also led to the announcement of a new partnership with DENC, Centerra, and Co’s for an infrastructure program. 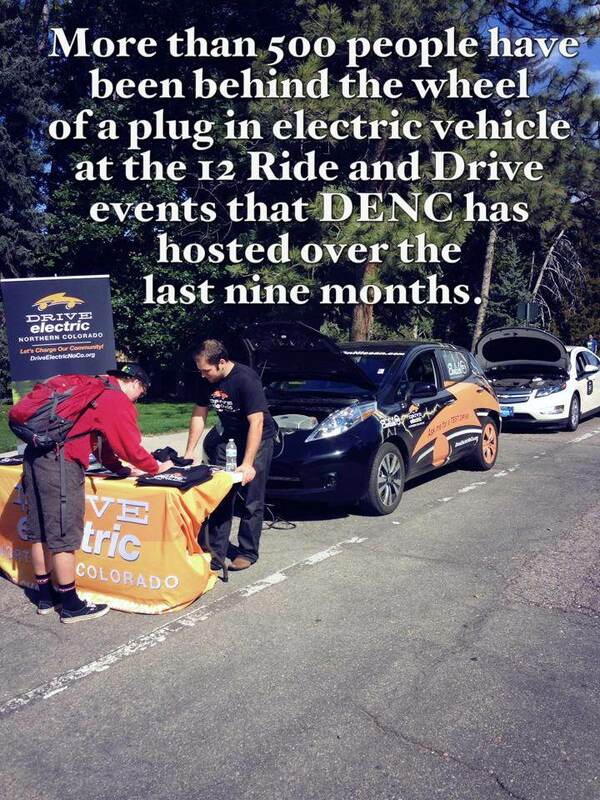 DENC also participated in more than 20 events in Loveland and Fort Collins to introduce PEVs to the community. These have included ride and drives that have put more than 500 people behind the wheel of a plug in vehicle, educational efforts at New West Fest, parades, and many more. DENC worked to help extend the state tax credit for EVs in Colorado, the effort including having the bill signing at Loveland Water and Power with DENC being prominently featured at the signing. New Belgium Brewing Company, Odell’s Brewery, Verboten Brewing Company, and Grimm Brother’s Brewhouse have all joined the EV effort over the past year by hosting Ride and Drive events to educate Northern Colorado about EVs. To help bring attention to the important effort, Odell’s Brewery also worked with DENC to create “Plug In Pale Ale”. Additionally both Odell’s and New Belgium have installed Level II Charging Stations that are open to the public. When DENC launched in February, Colorado State University joined the effort as a DENC partner. In the recent months the partnership has continued to grow in various ways. We are especially excited to have worked with CSU students to learn about EVs through the CSU EcoLeader Club, the EcoCar2 Club, and through the CSU Vehicle Innovation Fair. DENC also hosted the 2013 National Plug-In Day in Fort Collins to celebrate the growing number of EVs in Northern Colorado. 33 EVs gathered at the Fort Collins Museum of Discovery for an EV photo shoot and local businesses that have converted to EV such as Morning Fresh Dairy, the Fort Collins Downtown Business Association and Tynan’s Nissan, and Dellenbach Chevrolet attended the event to show their support for the program. Both Loveland and Fort Collins have increased the number of EVs in their fleets and are looking for more opportunities in the future. This has led to extensive media coverage and features at conferences and green fleet publications around the country. Additionally, many other companies have started to build EVs into their fleets including New Belgium, The Maids, Chippers, and many others are looking at transitions options in 2014. The Fort Collins Downtown Business Association (DBA) has been an active supporter in DENC and Mike Short, head of the DBA, can be seen driving a LEAF around town. In conjunction with Public Service Credit Union, DENC launched an educational series to help the public understand the economic benefits of EV transition. DENC continues to work closely with Fort Collins and Loveland, as well as local businesses, to create a long-term plan for electric vehicle infrastructure. So far, we have made great progress in creating the foundation for what will be a robust network of charging stations. There are currently 10 charging stations in Fort Collins and Loveland that are open to the public. 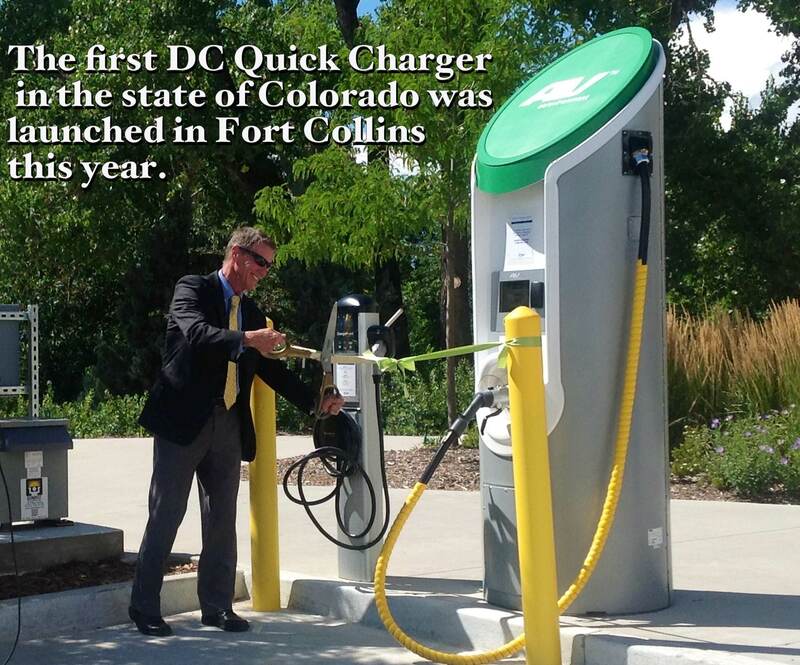 On August 5th the city of Fort Collins launched the first DC quick charger in Colorado, which is located at the Fort Collins Museum of Discovery and open for public charging. This charging station will enable many electric vehicle owners to charge their car in a fraction of the time it takes with a standard electrical outlet. Centerra, an award winning master-planned community that has joined as a new partner of DENC, will install several new level II charging stations and a DC quick charger that will be available to the public. In addition, many other local companies and businesses are looking at installing public or workplace charging, and working with DENC to provide charging for their employees. In January, DENC will release a illustrative infographic of current and planned charging stations in Fort Collins and Loveland. This will provide EV owners, as well as those considering an EV, with a simple visualization of where charging stations will be available for use in 2014. Going forward, DENC is seeking to build strong partnerships with local businesses to create workplace charging opportunities for employees. By enabling charging at a number of workplaces, we hope to increase EV ownership across the region. DENC is helping to keep the importance of transitioning to EVs in front of the public in various ways. 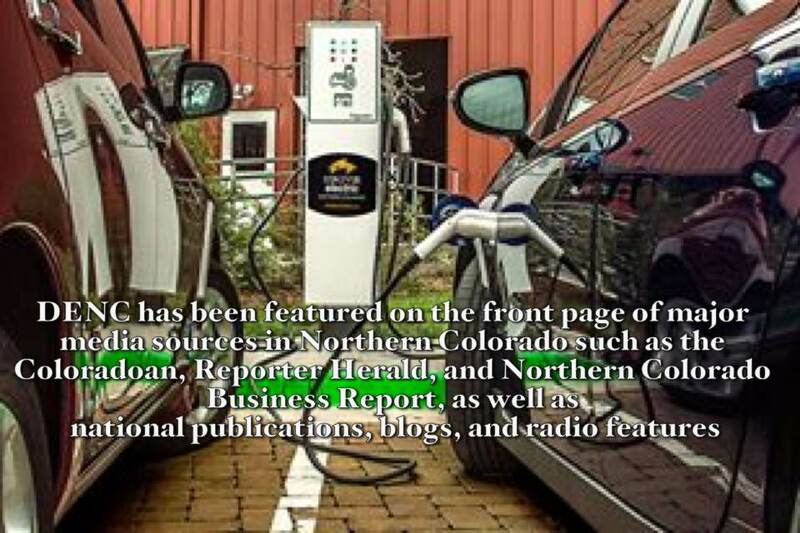 The program has been featured on the front page of major media sources in Northern Colorado such as the Coloradoan, Reporter Herald, and Northern Colorado Business Report, as well as national publications, blogs, and radio features. A recent case study with the city of Loveland has been featured in several national fleet publications and was recently highlighted in the American Public Works monthly newsletter that goes out to utilities around the country. Earlier this year DENC and the city of Loveland worked to send a postcard to 31,000 households in Loveland, to help the public learn more about the benefits of driving a PEV. The City of Loveland, The City of Fort Collins, Colorado State University, McWhinney, New Belgium Brewing Co., The Maids Cleaning Services, Tynan’s Nissan, Dellenbach Chevrolet, Ehrlich Nissan, Davidson Gephardt Chevrolet, Northern Colorado Clean Cities, Public Service Credit Union, Co’s BMW, Centerra, ClimateWise, the Sustainable Living Association, Odells Brewery, Verboten Brewery, Grimm Brothers Brewhouse, Chippers Bowling Lanes, Nissan North America, The Downtown Business Association, Schneider Electric, The Rocky Mountain Innosphere, SWEEP, Fort Collins Museum of Discovery, and Bohemian Companies.